In the iOS mail app, you get the little red dot with the number of new messages displayed by the mail icon. This Badge App Icon doesn't seem to display for when new messages arrive in a folder. How do I enable this? Account is Outlook.com. Try going to Settings>Mail>Outlook>Notifications. Turn Badges off and then back on. Folders wont show up in your notifications. If you want that feature you should use the Outlook app for the iPhone then you will have more folder notification options. The default Mail.app will only show notifications for the inbox and not nested folders. Hmm, doesn't appear the Outlook app is giving me the red icon notification when a new message appears in a folder either. On iOS, mail comes in on the inbox. You have to add them to a folder. You can create folders. Also, for important mail, you can set up VIP. You can add any of your contacts to VIP. The notifications for VIP are separate from the other inboxes. I can't be the only person who makes extensive use of message rules to automatically sort messages into folders based on various criteria. These rules are applied server-side (Outlook on the desktop syncs these rules to the server), so when mail comes into iOS mail, it's already sorted on the server. I want to know when there's new mail, regardless of what folder it comes into. Your mail comes in on the inbox, and you should get notifications when they do. Be sure your notifications for mail is set how you want in settlngs > Notifications. 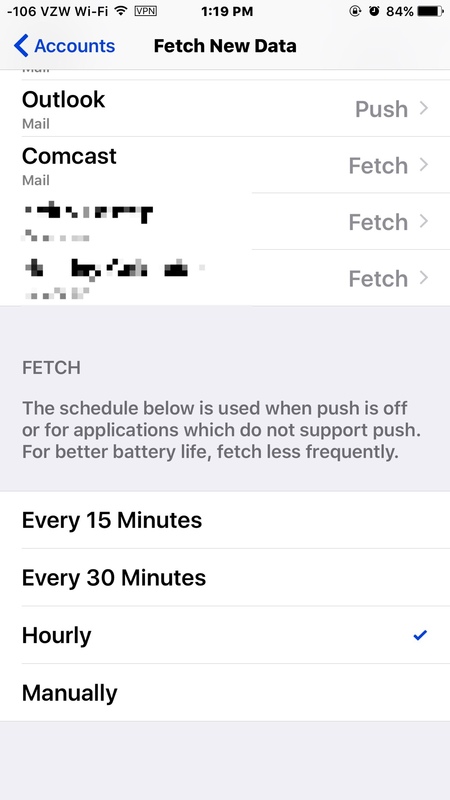 Also, some in iOS Mail don't use push. They use Fetch. So you need to set fetch how you want it in settlngs. Outlook uses push I think. Nope, my email comes in directly into the folders the server side mail rules sorts them into. Inbox is just technically a folder within a mailbox. You are not. However, I know that this doesn't help you, but the Google InBox app lets you get notifications for particular folders (or labels, as Google calls them), but it works for Google accounts only. Of course, the stock Gmail app can do this for Gmail accounts as well, though not if you skip the in box. Still, you can have rules apply labels to incoming messages and when you archive a message that you want to keep, it keeps the label. I've looked at some other email apps (Spark, Edison) but I don't think either of them lets you get notified of email sorted into folders by server side rules. If you must get notifications for these emails, I suggest using copy rules on the server side to copy mail to folders rather than move rules. But, of course, that means cleaning up your inbox all of the time. I chose iPhone because I didn’t want I be google’s product. Not switching to gmail. Yikes, this keyboard is sad. All my mail comes directly in my inbox. None, except spam, come in direct to folders. Not sure how that's done on iOS Mail. In the history of email I don't think I've ever came across a solution to getting notifications when rules are enabled to have certain all go into specified folders. Notifications work for the inbox but I don't see a way for them to work on sub folders. Unless the specific mail server allows it. All iOS needs to allow is to enable notifications for specific folders. I there a reason you can't add the contacts from those folders to VIP? You would get notifications that way. A lot of the senders aren't in my contacts and the mail rules are set up to file based on keywords in the sender/subject line. I can't believe people would rather sit there and file 100 emails a day than have rules take care of it all. Mail is definitely an area Apple could improve. So is Calendar. xtremeled and ladyc0524 like this. Of course, with an outlook.com account, you are "Microsoft's product". FWIW, you can keep the outlook.com mail address and use the Gmail app with it, using Google's "GMailify" feature for outlook.com (and yahoo and hotmail) accounts. This will give you Google's spam filtering, their (optional) separation of mail into primary, social, promotions, updates, and forums, and will allow you to set server side rules that will automatically label messages, just the way that you are now. With Gmail, messages can be both in the inbox and in sorted labels at the same time, is you will still get notified of all new messages. I know that you don't want to have a Google account, but this may be worth at least a try, as I think it's the only solution that will do what you want on iOS. (You can turn off Gmailify at any time later on.) The filtering rules are very powerful. That said, I haven't done this with my Outlook.com account, though I am about to try it out now. To a much, much less extent. I'm not sure I like the idea of Gmail moving my messages around on the phone. Sounds like I'd have to disable all the Outlook.com rules and let the Gmailify app do it, rendering my email on the desktop screwed up. Wow, I'll say it's bad. In this view, how do I know what days are busier and which days I have a lighter load? That's what a calendar is supposed to do - show me what my month looks like. Compared to the BB10 calendar where I can see at a glance every day in the month where I have the most free/busy times.